We have it all wrong! Our modern political view of “Democrat” on the left versus “Republican” on the right is misleading because the political parties are rarely if ever principled. Likewise, the modern mismeasurement which puts communism at the extreme “left” and fascism at the extreme “right” is false because they are simply different names for similar forms of despotism – the police state. Under “Ruler’s Law,” the people are not equal but are divided into social and economic classes, where the thrust of government power is from the ruler down and not from the people upward, where government has the ever-growing power to give or remove the God-given rights of the people, and where rule is determined by the whimsical edicts of men rather than the fixed rule of law. In addition, with a centralized government, freedom is never considered a solution to anything, while problems are always solved by issuing new edicts, creating more bureaus, appointing more administrators, and charging the people more taxes to pay for these “services”; plus, those in power revel in luxury while the common people are enslaved by perpetual poverty, excessive taxation, stringent regulations, and a continuous existence of misery. Sound familiar? On the other hand, “People’s Law” places the political power at the balanced center with enough government to maintain security, justice, and good order, but not enough to abuse the people; through this form of government, the people are the sovereign (through the local, state, and federal governments, in that order), rather than one person or group, while the rule of law (based on what the Declaration calls “the Laws of Nature and of Nature’s God”) is fixed as a preserver and expander of individual freedom and rights. Also, it is the people who grant leadership temporarily and retract it straightforwardly, who are individually responsible for resolving their own problems (with the help of their family, their community, and, as a last resort, their government), and who possess unalienable rights that cannot be violated without risking the wrath of Divine and civil justice. So, the question is – Are we willing to put principle before party and propaganda? When we hear the promises of politicians, can we ignore the (R), (D), or (I) beside their name and simply judge them, their rhetoric, their ideologies, and their agendas by whether or not they support “People’s Law” or “Ruler’s Law”? Are they loyal to their party or “We the People”? Do they believe in the power of the individual to pursue happiness for themselves or in the “ability” and “responsibility” of government to take care of and pursue happiness for the individual? 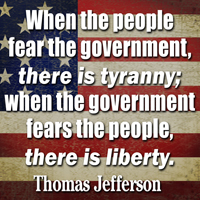 Most of our leaders, on both sides of the political aisle, have forsaken the “People’s Law” of our Constitutional Republic, tightening their grip around Liberty’s neck while feeding tyranny with their unprincipled greed, corruption, and selfishness. We who love freedom and believe in Constitutionally limited government, free markets, and fiscal responsibility, are working within the Tea Party movement to restore Liberty (In truth, we are the true political moderates because we prefer the “medium point” or balanced center of Liberty that our Founders built America on). For the last many years, America has been devolving – like Rome and Greece of old – more and more toward tyranny, and we are concerned that our children and children’s children will not inherit a free country. If you share this burden, join us at Western Sizzlin every first Thursday at 6:00 pm as we work together to keep America free.